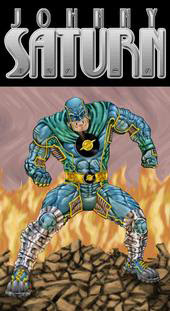 Scott Story, one of the many friends I’ve made on MySpace, is the talent responsible for sending a superhero to hell. Johnny Saturn is his long-running, full-color webcomic currently at home on Graphic Smash. This site is intended as your resource for all-thing Johnny Saturn, especially the many characters who pass through the strip. Scott and his wife began the comic with a basic question: Which is superior? Super powers or martial arts? Martial arts or great intellect? Great intellect or the will to succeed at any cost? “Though we have gone on to explore other questions, this theme is still central to the story,” he says on his website. Scott Story is a freelance illustrator and cartoonist who lives in the Midwest. He’s done album covers for bands, covers and interior illustrations for table-top role-playing games, advertising illustrations for large corporations, logos for individuals and businesses, graphics for websites, illustrations for magazines, and private commissions of all types. You’ve got to love a writer with the last name “Story”.